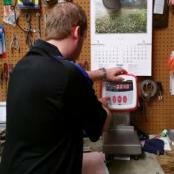 Calibration of a scale is a procedure in which a licensed scale technician uses a known test weight certified by the State of North Carolina Bureau of Weights and Measures, to test and adjust the response of a mechanical or electronic weighing system to the following tests; The display indicator must show zero when there is no weight on scale. When a known weight is applied the indicator must display the exact amount of applied weight within a specific tolerance. When weight is applied or removed incrementally the scale must display the weight equal to that on the scale within the specified tolerance mentioned above. Not all companies are created equal. We have been selling, repairing, and renting scales since 1980. 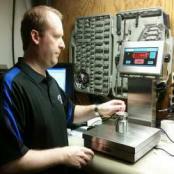 Calibration is actually an important component of your scales accuracy and dependability. That's why we train our technicians on the proper way to calibrate scales and we use certified test weights for maximum accuracy. Every so often someone will ask do you need real professional weight to put on a scale and sometimes in a pinch you might be able to get away without a weight but generally it is highly recommended that you use certified weights for scale calibration. Not just any weights, they ideally need to be certified weights or weight kits. The procedure is roughly the same for most average size scales. First, make sure the scale is empty and the display shows zero. Then add a known weight and notice what the display shows. If it is within tolerance, no adjustment should be necessary. If it is out of tolerance, adjustments will need to be made to bring it within tolerance. Our factory trained tech's also pay attention to the weight as it is placed on the scale to see if it is consistent as each one is added and we also like to place the weight on different corners of the weighing platform. This is generally true no matter what brand you're talking about from Avery Weigh Tronix to Rice Lake Weighing Systems. Sometimes when you are dealing with truck scale testing it can involve a few more steps such as adjusting sections but the basic principle is the same. For the most part you should call in the professionals when it comes time to calibrate a scale. The pro's have the experience and the right equipment. Even though sometimes the instructions are in the operator manuals or user guides, it is still best for the professionals to handle this since we have the experience and equipment for the job. It is really rewarding every time a new customer calls or emails us looking for calibration services. We're located in Sanford but we have customers all around North Carolina & the triangle area such as Raleigh, Durham, Burlington, Smithfield, Fayetteville, and more. We obviously provide industrial scale calibration and scale repairs but one example you might not think about is medical scales. We do have quite a few local customers in the healthcare industry who call us looking to have their physician scales checked. This is something that we can certainly do since we have factory trained technicians and certified test weights. We are sometimes asked how to check your scale or how often do you need to calibrate your scales and the answers can vary depending on your situation. For most situations, it is a good idea to have scales checked at least a couple times a year. 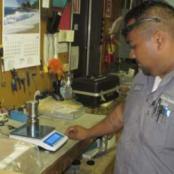 Depending on how important scales are in your business, you might want to have our factory trained technicians check them every month or every quarter. To check the scale you simply put an item on the scale and see what it weighs. Ideally this would be a certified test weight or it can be some other "known" weight. Then check to see if the scale is displaying the right weight. Another example might be if you own a portable truck scale, you should probably calibrate that scale every time you move it from one location to another location. Or at least check it with a known weight to make sure the accuracy is still acceptable. Calibration DefinitionWe have been checking, testing, adjusting, and calibrating scales since way back in 1980. Click here to find out more about the definition and process of calibration. Service - Planned Maintenance ProgramPlanned Maintenance Program customers enjoy using their accurate and reliable scales throughout the year along with the benefits of special labor rates and reduced mileage charges and preferential scheduling. Calibration TolerancesWe have been checking, testing, adjusting, and calibrating scales since way back in 1980. In general, industrial scales are accurate to 0.1 of 1 percent of the test load. Service - Repairs & TroubleshootingOur Factory Trained Technicians can repair and troubleshoot scales and since nobody in the Carolinas stocks more replacement scale parts than us, we can get you back to weighing. One of the tremendous advantages that our scale repair and service provides you is we provide factory trained scale technicians to work on your scales and we use certified test weights and precision weight kits. When we check your equipment it is checked with accurate weights and the accuracy is written down on our scale calibration report and we place labels on your devices which shows the date they were checked and the due date for the next service. One question we are asked sometimes is how do I calibrate my scale without weights? There are two examples we can look at. First, if you are lucky enough to have a laboratory balance that includes internal calibration, technically you don't have to posses any weights because the weights are already in the balance. Another example would be using a known weight. Say you are out in a warehouse that has two or three floor scales. If one of the scales needs to be checked, just place an item on one of the other floor scales and get a weight. Place that item on the scale you need to calibrate. This is not a perfect solution but it should work until you can get a scale company in with real test weights. Hopefully some of the highlights above have assisted you with calibrating digital scales. We have been servicing and repairing scales throughout much of North Carolina for over three decades. We encourage you to browse our website and contact us (919) 776-7737 for your weighing needs.